GAITHERSBURG, Md. 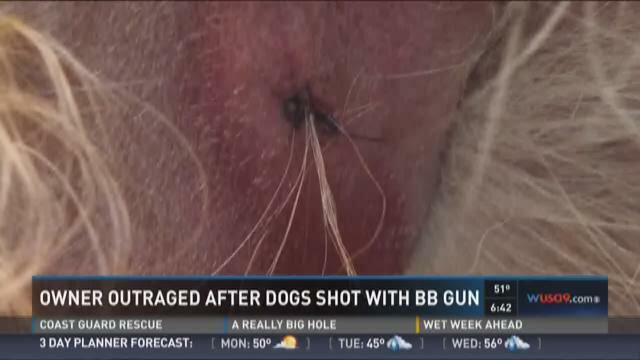 (WUSA9) -- A Md pet owner says he’s happy the shooter didn’t accidentally hit a kid, but he’s still furious someone shot his two dogs with a BB gun. “Being neighborly, I would’ve expected if someone had a problem with the dogs, they come talk to me first instead of shooting um, because I mean, my boys, especially my eldest, he’ll go run out and chase the dogs too and that was the biggest concern for me,” said Brian Sundstom. Angry, concerned, upset, Sundstom says he wants the person responsible found after Montgomery County Police say someone shot at his two dogs between 20100 block of Woodfield Rd. and the 20300 block of Rosethorn Ave. in Gaithersburg. It happened at around 6:30 p.m. on Wednesday, February 10th. Rosethorn Ave. is a cul-de-sac in the Rosewood Estates neighborhood, just behind Sundstrom. He tells WUSA 9 the dogs got loose and ran towards there two Wednesday’s ago. When they returned, Sundstom says he found the dogs bleeding. “Right here, she’s got a scar right there under her ear,” Sundstom said showing us the injury behind his Pit Bull-mix, Dizzy’s ears. His other Terrier-mix, Penny, had to have a pellet-type object surgically removed from her inner thigh. Both are rescues believed to be 6 to 8-years-old, their owner tells us. Sundstom believes a pellet gun may have been used, the injuries were so invasive. 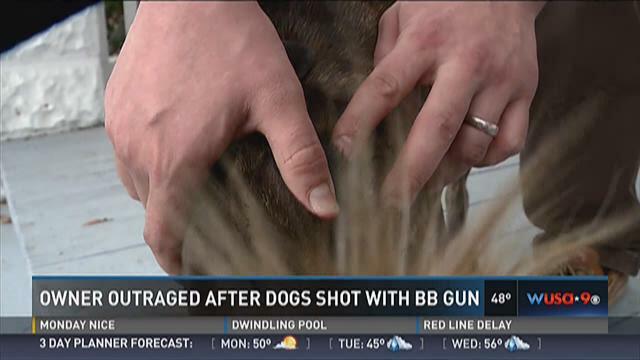 Montgomery County Animal Services believes it was a BB gun. Either way, both Sundstrom and Police want the person or people responsible to come forward. A “coward” is how the Montgomery County Animal Services Director, Thomas Koenig, described the shooter over the phone. Sunstrom believes the dogs went to a nearby home that has some kind of backyard bird, possibly chickens. “There are three things that you don’t do: mistreat the elderly, mistreat children and mistreat animals of any sort. I think it’s inhumane,” said a woman visiting her parents on Rosethorn Ave.
Dr. Paul Boyle lives next door to the woman’s parents and tells us he hadn’t heard anything of it. “It’s just unconscionable that somebody would take a shot at an animal that’s pretty much defenseless,” he said. Sundstrom says he doesn’t want a fight with his neighbors and installed an electric fence to prevent this happening again, but he still wants the person responsible to be held accountable. He tells WUSA 9 the emergency vet bill cost $500 for Penny’s visit. Anyone with information should call Montgomery County Animal Services at (240) 773-5693.